Rubbermaid For Less is your one stop shop for Rubbermaid janitorial supplies, brooms, brushes, dust mops, wet mops, floor squeegees, mop buckets, janitorial carts, microfiber pads, microfiber towels, dusting tools, mechanical sweepers, carpet cleaning bonnets, upright vacuums, backpack vacuums, wet/dry vacuums, baby changing tables and Rubbermaid air fresheners. With 32 national distribution points stocking over 600 Rubbermaid products we can serve your needs in most cases within a day of your order. If one of these 32 national distribution points does not have what you need in stock we will fulfill your order from our Utah distribution center where we have over 1500 Rubbermaid products stocked every day! 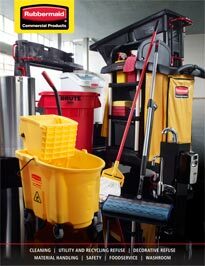 Please browse our entire line of Rubbermaid janitorial supplies by clicking on any of the categories below.